Andi B. Goode: Show me what you've seen. Show me what you've seen. It's that time of year again - Halloween! And that means it's Halloween costume time, too. Huzzah! I love looking at other people's costumes but, of course, I also like making my own. Last year, I was a pumpkin and you can see some others (as well as non-Halloween costumes) I've done on this Pinterest board. Since I started dabbling, for lack of a better word, in cosplay I've created a long list of costumes I want to do one day. One of them happened to be Abaddon in her grey dress from season 8 of Supernatural, which was kind of perfect for Halloween. 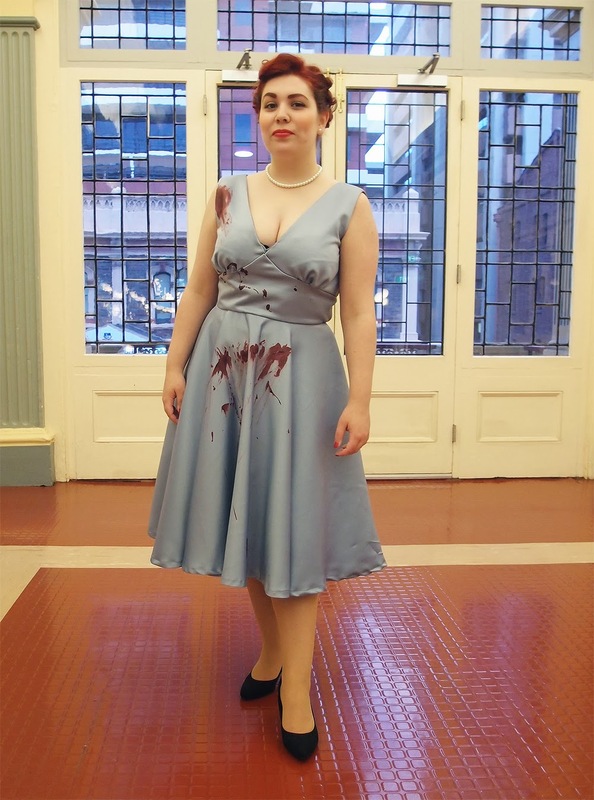 With the thesis, and my dislike of sewing at the best of times, my mum sewed my dress up for me but I still had my hair, make-up and blood spatters to do! Anyway, I've been told lately that I'm too wordy (well, only by my thesis supervisor) so how about some pictures of said costume? The hair was probably the hardest part for me. Looking closely, I realised the continuity for Abaddon's hair isn't really that great but it still all looked very complicated to me. This lovely person on tumblr put together some good reference shots, which proved helpful to me. The biggest help, though, was the lovely Ruby Armoire. She spent a lot of time giving me tips and instructions (and even drew a diagram!) on how to do this style. You should definitely go check out her website and/or Facebook page. The style is still more of an approximation than an exact recreation, but I'm really happy with it. Here's a full shot - I'm making my SRS DMN BSNS face. I made the blood using clear puff paint and gel food colouring, an idea I got from the same tumblr user who did the reference shots of the hair. I had a lot of helpful suggestions for blood but, in the end, I decided I wanted something permanent. The puff paint means that the thicker bits dry looking a little wet so it still looks like fresh blood. It is a more expensive method, though - if I'd had more money I'd have added some yellow to brighten up the blood. 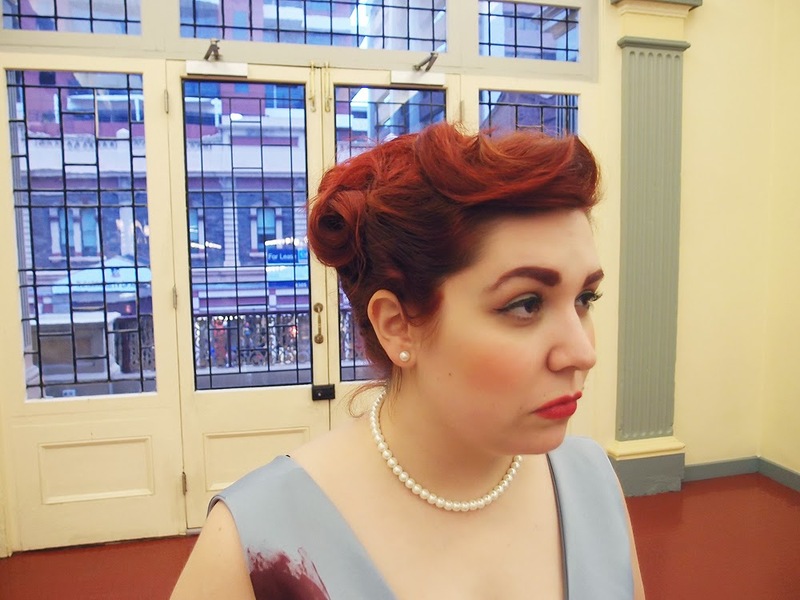 You can see more photos of my hair on Tumblr. I'm really proud with how my hair turned out, because it was what I was most worried about. For anyone who hasn't seen the show or any pictures of Abaddon, below are some screencaps to give you an idea of what I was working to. I just love Abaddon's make up and, luckily, it was super easy to do. 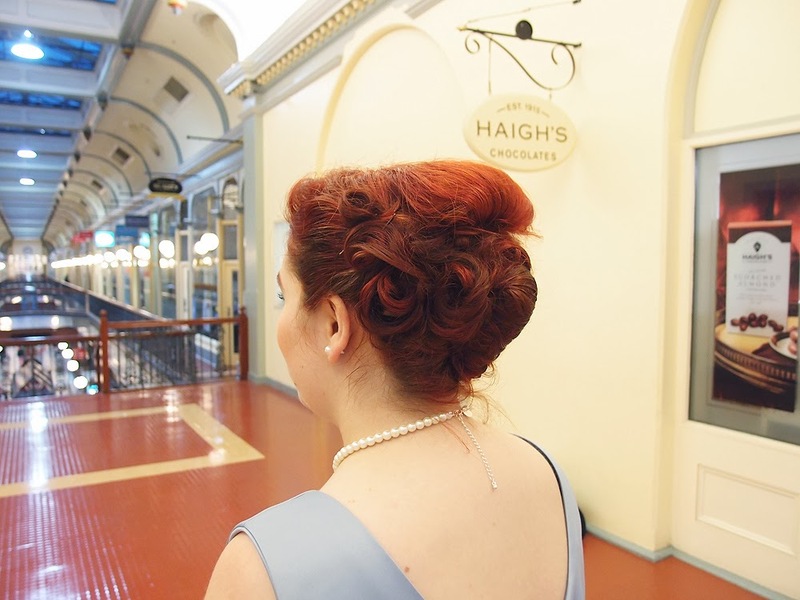 The back of my dress scoops down and the perfectionist in me is screaming in irritation! (I got overwhelmed & tired & forgot until after the dress was made). I'm trying to ignore it...even though screen accuracy is really important to me. Ah well. You live, you learn, no? 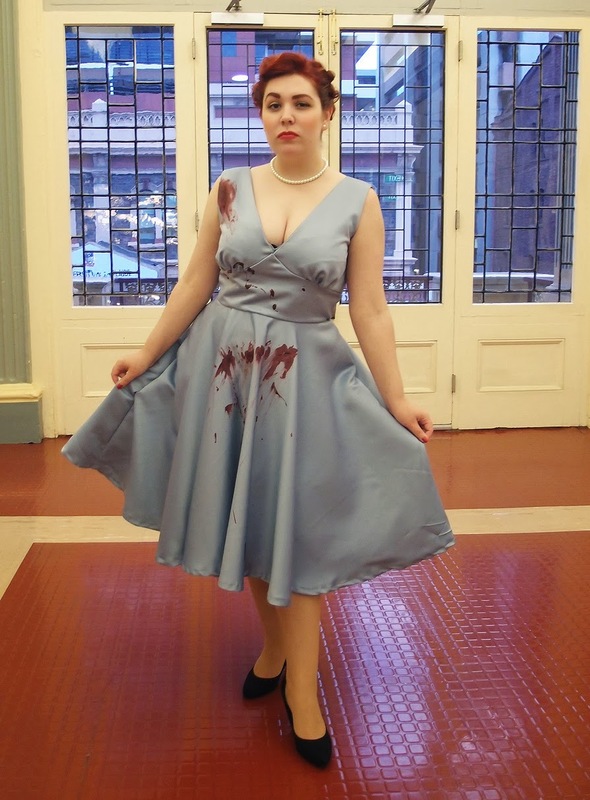 I think I might add more blood to my dress before I wear it again. Not sure. Despite the back of the dress, I'm really happy with this costume - I think I may wear it, again, for Supanova. I only got to wear it for about an hour or so, and I feel a bit silly for that, so I think it needs a proper outing, you know? What a great costume! I'm still catching up on Supernatural so I haven't got up to season 8 yet, but I'm up to season 4 and I'm really enjoying it so far. This is such an sensationally cool costume! You look absolutely gorgeous in that shade of soft, classic grey, and with your hair swept up into such a glamorous 'do. Way to rock a creative, and at the same time beguilingly pretty, Halloween look, dear gal! This is fab! I've yet to watch Supernatural, so thanks for including the caps! Looks perfect! Definitely deserves more outings. I never do anything for Halloween, but it's fun to look at costumes! You look sensational! I've never actually watched Supernatural (it's high on my to-watch list though), and your costume has made me feel even more anxious to check it out.